As I’ve mentioned earlier this week, I’ve been battling a nasty head cold, complete with headaches. This has rendered me into something of a robot the past few days, just carrying out duties without much soul: wake up, take some Tylenol and hope it works, feed the kids, change the kids, put on something that entertains them (with the volume on low) and pull out some coloring books, cover head with pillow and clutch a box of tissues and listen to kids to make sure they don’t kill each other and hate the sun and sounds and pretty much the whole world, feed kids lunch, wipe them down, put them to nap and fall asleep with them, wake up, take more Tylenol, kill another forest via tissues, get dinner going. Then my husband would come home, and I’d generally hide in bed right after dinner. Not really a pretty picture, but at least the headaches aren’t as bad as they were yesterday, so it looks like I might be near the tail end of this. But my first thoughts as I’d gotten sick were not “Woe is me,” but rather “I hope the kids don’t get this horrible cold.” Of course, as a parent, I just don’t want my kids getting sick. But there are deeper considerations. First of all, it’s hard to care for a toddler (like Sunfilly) who can’t really express why she is miserable. Instead, she will just scream and cry and be rather uncooperative with my inspection of her to determine what is wrong and help her be less miserable. Secondly, the American Academy of Pediatrics has made recommendations against giving over-the-counter cold medicines to children under 6, and, generally, your pediatrician won’t prescribe any cold or cough medicine unless your child is pretty sick. And, thirdly, a trip to the doctor with a sick kid in tow isn’t exactly cheap (at least, this is the case in the US, even if you have a good insurance plan–which we do). Not to mention, sometimes germy kids share their germs with each other in that waiting room. There’s nothing like bringing your kid in for a sinus infection, and then three days later she comes down with the flu or some other nastiness. Well, you can still help her build her immune system, but there are things you can do to help her if she is sick, or at least to take preventative measures. That’s right–what I’m talking about are home remedies. It doesn’t mean tossing some bones, shaking a snakeskin rattle over your kid’s head and chanting in Sumerian. Well… I suppose you could still do that, if it floats your boat. But you’d be surprised how many home remedies–also known as “Old Wives’ Tales,” and don’t get me going on that historical diatribe–turn out to be medically recognized, or even recommended. Below are a few such medically-recognized home remedies (with supporting links). Most of these are pretty useful for pregnant women as well, and certainly any otherwise healthy adult. And here I’ll give the disclaimer that I am not a medical professional. Please consult your doctor if you have any questions or doubts or if you are on any medicine or have some chronic issue. Herbs can cause dangerous side-effects or trigger allergic reactions, so pay attention to how much you use. And always employ common sense when you are sick, even if you’re using prescription medicine: if your symptoms get worse or don’t improve, you need to contact your doctor. There could be something worse going on in your body. 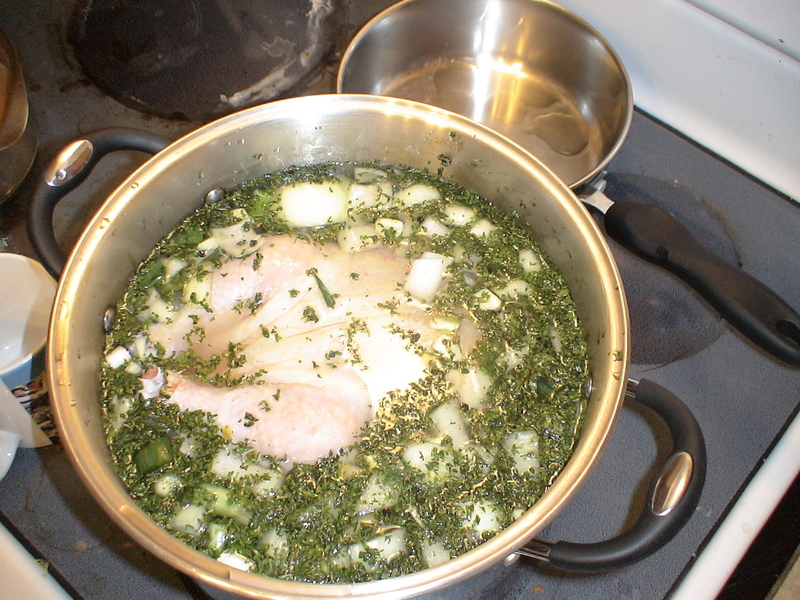 The ingredients for chicken broth have just been put on the stove to cook. Chicken Soup: It really is a great way to combat the common cold. It may not cure the cold, but it certainly helps your body fight it. The steam from the soup helps open your nasal passages, and the combination of all the ingredients that generally go into chicken soup work as an anti-inflammatory, helping to prevent sinus infections. Chicken soup also contains carnosine, a natural antioxidant only found in chicken meat, which some studies suggest boosts the immune system in fighting the cold and the flu. And from personal experience, I’ve found that the broth also feels amazing on a sore throat. And if you have a sore throat, you generally don’t want to drink, and so chicken soup is a good way to rehydrate. 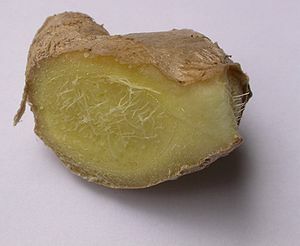 Ginger: The ancient Chinese recognized ginger as being one of those multi-use medicinal herbs. While scientists are still trying to examine all the benefits of ginger root, they have identified a few already. For instance, ginger is useful for combating nausea. You can use ginger ale, but because I’m not a fan of giving my kids too much soda (my old dentist referred to soda as a “liquid chainsaw” for kids’ teeth) I prefer to give my kids a dime-sized bit of crystallized ginger, as it has the same effect of calming their little upset tummies (I also used ginger in teas to help with morning sickness). Ginger is also packed with beneficial vitamins and minerals. Honey: First of all, I cannot stress enough that you should never give honey to an infant under 12 months old, as they can get infant botulism, which is deadly. 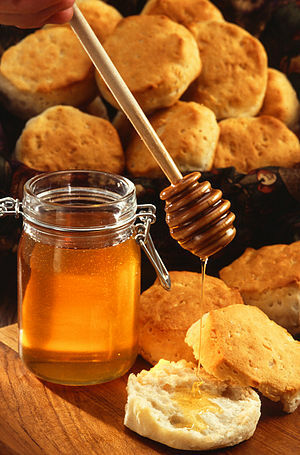 But honey is packed with antioxidants and scientists are finding that honey may help in combating allergies. I have personally noticed that local honey has helped me with my newfound Ohio allergies. If you’re going to get local or raw honey, you want to make sure that the bees didn’t visit toxic plants (or even some non-toxic ones), as the toxins can transfer to the honey and make you very sick. Honey is also beneficial if you have a cough. In fact, the American Academy of Pediatrics recommends giving your child honey if she has a cough (1/2 teaspoon for children aged 2-5 and 1 teaspoon for older kids). Eucalyptus: Eucalyptus is used in lozenges and teas to relieve coughing and congestion. While you can’t give lozenges or eucalyptus tea to children, you can put a couple drops of eucalyptus oil in their cool mist humidifiers–but you really need to check with your pediatrician first. I made sure to have the green light from my pediatrician the first time I put eucalyptus oil in Starkitten’s humidifier when she was an infant. Never feed eucalyptus to your child without consulting a doctor, as it is toxic. Cayenne: It’s a staple spice in most Southern cooking, but it also is great for boosting the immune system and may be helpful in fighting sinus headaches. I usually just cook a dish using cayenne pepper (ideally fresh) when I am very congested. And, from my experience, pretty much any spicy dish will help clear the sinuses (which is why I’m also eating a lot of curry lately). If you decide to use cayenne supplements (like those found at a health foods store), you should check with your doctor first, since cayenne can lower your blood pressure and blood sugar and interfere with prescription medicines. When I was pregnant with Sunfilly, I experienced a slew of illnesses you wouldn’t want to have while pregnant, like food poisoning and appendicitis. I also had a nasty cold that was going around my law school at the time. I couldn’t take any medication, since I was in my first trimester and thus very limited on what I could take. What was doctor-approved was homemade ginger tea. It felt amazing on my raw throat and helped clear my sinuses. It was also very soothing for an upset stomach (a blend of sinus drainage and morning sickness). Add the ginger and lemon. Cover and boil for another 2-3 minutes. Remove from heat and allow to steep for another minute or so (depending on how strong you want it). Strain the tea and pour into a cup. Add the honey. It may still be too hot, so check the temperature of the tea before drinking, especially if you are preparing the tea for a child. Lemons are certainly rich in Vitamin C and may help boost the immune system, but there is not enough scientific evidence to quantify the extent, if any, of medical benefits in lemons. I have found, however, that lemon in tea does wonders for a sore throat, which is why I include it in my health tea. Hopefully you won’t be this miserably sick. But if you ever are, seek comfort in chicken soup and some soothing tea. If nothing else, it will give you warm fuzzies that will lift your spirits. NOTE: I meant for this post to go out on October 29. My apologies for such tardiness. It’s difficult not to think we are having winter in October. In the South, winter brings temperatures where the lows are in the 30s and the highs are in the 50s. In the North, apparently it still qualifies as fall. 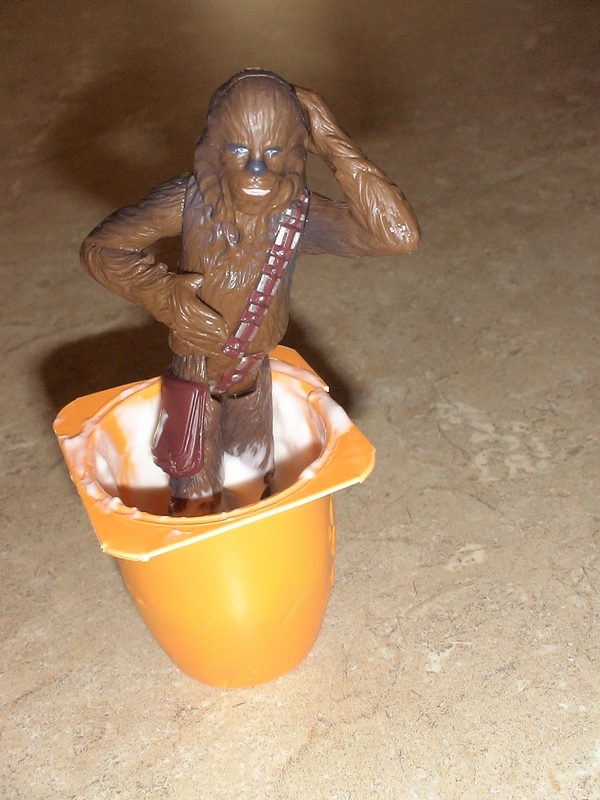 This is just one of a hundred daily parenting adventures I get to experience: Chewbacca doing the macarena in yogurt. Strawberry yogurt, to be exact. But it’s been so chilly in the mornings that I can’t take the kids out, and it’s not sufficiently warm (to my standards) to play outside until about noon, which is lunchtime–followed by naptime. So the kids have spent a lot of time indoors lately, which makes them restless. And that results in episodes of Chewbacca doing the macarena in yogurt. Adjusting to these new temperatures–especially after enduring record heat (in the triple digits for pretty much the entire summer)–has been a challenge. Needless to say, this has been a drastic temperature change. And with temperature change comes the sniffles. As the mother of two toddlers, I know that there isn’t much in the way of over-the-counter medicine available if they get sick. So, I try to keep the sniffles from getting worse so that they don’t get so sick as to warrant a doctor’s visit to get some prescription expectorant. Since we don’t have the thick fur of Wookiees to keep us warm (although if you met the men in my father’s side of the family, you may wonder if we had Wookiee ancestry), I have to fall back on traditional recipes and herbalism. Among at-home remedies, I make lots of chicken soup, put some eucalyptus oil in a cool mist vaporizer, feed them fruits rich in vitamin C, and serve them hot beverages. I particularly like serving them teas with ginger because ginger is so great for their health in general. One of the teas we make in this household is a Kenyan version of chai. It’s worth noting, for those who may be familiar with Indian foods and culture, that Kenyan cuisine (at least for the region my husband is from) is heavily influenced by Indian cuisine. They are not identical (for instance, the way I learned to make pilau involves beef, which is typically off menu in Indian cooking), and so I find learning to prepare Kenyan food teaches me about several cultures. In case you needed an explanation of how Kenyans got to cooking Indian food, I’ll give a brief history lesson: Indians were brought to the various British colonies in Africa in the 1860s as indentured laborers. While treated horribly by the British and hated by Africans, many eventually worked their way out of servitude and became very prosperous. 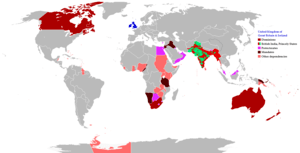 This led to much friction between ethnic groups, to say the least (not to gloss over history–but examples include Idi Amin‘s expulsion of Asians from Uganda, apartheid in South Africa, and the treatment of Indian laborers in the British colonies that changed the life of Mohandas Gandhi). Despite all this, Indian-Africans were able to contribute much in terms of culture, business and industry, and cuisine to the new continent they called home. And many of the contributions were downright awesome. Tea that grows on my inlaws' tea plantation. They are small shareholders in one of the many growers' co-ops in Kenya. 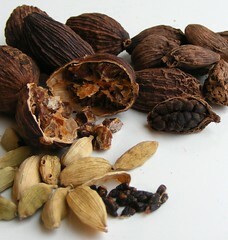 Kenyan chai is similar to, but still different from, traditional Indian chai. Indian chai, to begin with, is usually made with Darjeeling tea or some other black tea grown in India. 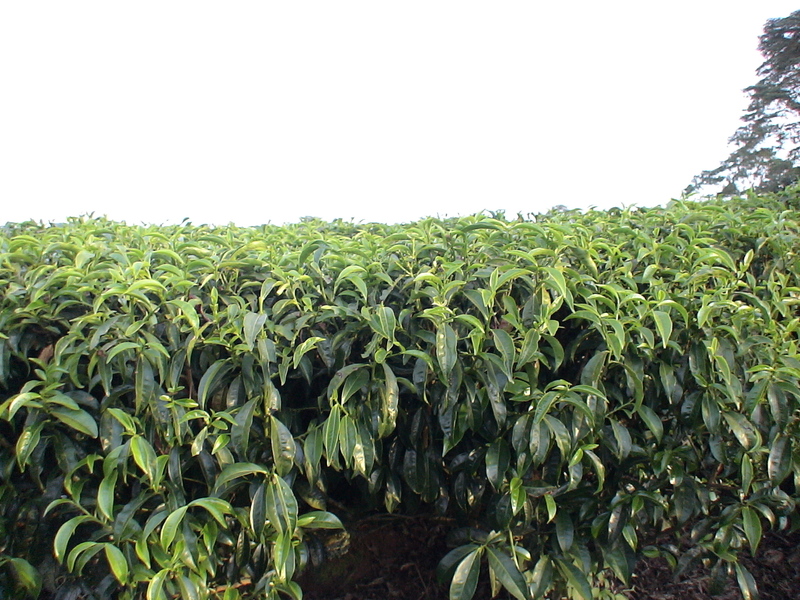 Kenyan tea is mostly grown in the Rift Valley province. It has a unique flavor because of the volcanic soil and, because of the country’s equatorial location, tea growers can produce tea year-round, making it the third-largest tea exporter in the world. There are countless ways to prepare chai. It’s generally black tea, milk, sugar, and spices (usually pre-mixed into masalas–which could be likened to dry rub salsa in Indian food). The spices one chooses depends on taste and intent (there are recipes for Love Chai and Health Chai, just to name a few). You will first need a clean, empty jar into which you will pour the finished product. I have a terrible habit of saving all my glass spice jars for making various spice blends for this purpose. If you don’t have any old spice jars, many grocery stores sell empty jars that would be just as suitable. I find that using a funnel to pour my masala into little spice jars makes life infinitely less messy. *Note: You can omit the ginger and instead add freshly grated ginger directly to the tea. Or if you love ginger as much as my family does, you can do both. † These spices are said to have immune-boosting qualities. Thoroughly mix all the spices together in a bowl. Pour the mixture into a clean, empty spice shaker. That’s it! 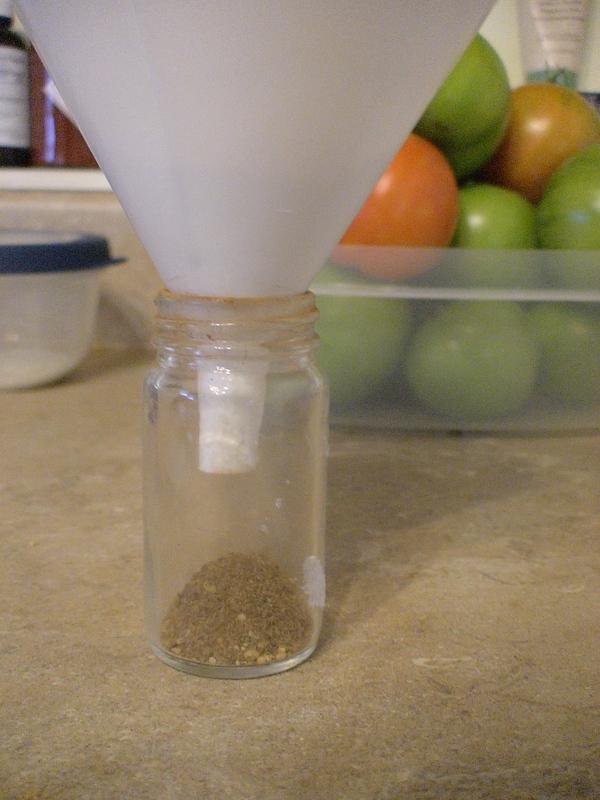 You can double the mixture if you have a larger container and plan to use it up pretty quickly, as the spices may lose some of their freshness over time. To make chai, you will need tea. You can use loose tea (that is how many Kenyans make it) or tea bags. If you use loose tea, the conversions would be 1 teaspoon of loose tea to 1 tea bag. You would then need to strain the tea before serving. In reality, you can use any black tea when making chai. We try to use Kenyan tea whenever we can. My husband’s preferred brands are Ketepa (which also markets under the Safari brand) and Kericho Gold (which only buys from organic growers); either of these can be purchased online through various merchants, but it can sometimes be rather costly. Darjeeling teas and English breakfast teas are more affordable and easier to find in your average grocery store and will do just as well. Pour water and milk into medium saucepan. Bring it to a boil, then reduce heat to low. Add tea bags, masala, and sugar. Remove from heat. Remove tea bags. Serve. Makes approximately 3 cups of tea. Kenyan chai goes great with toast, peda, or pumpkin bread. 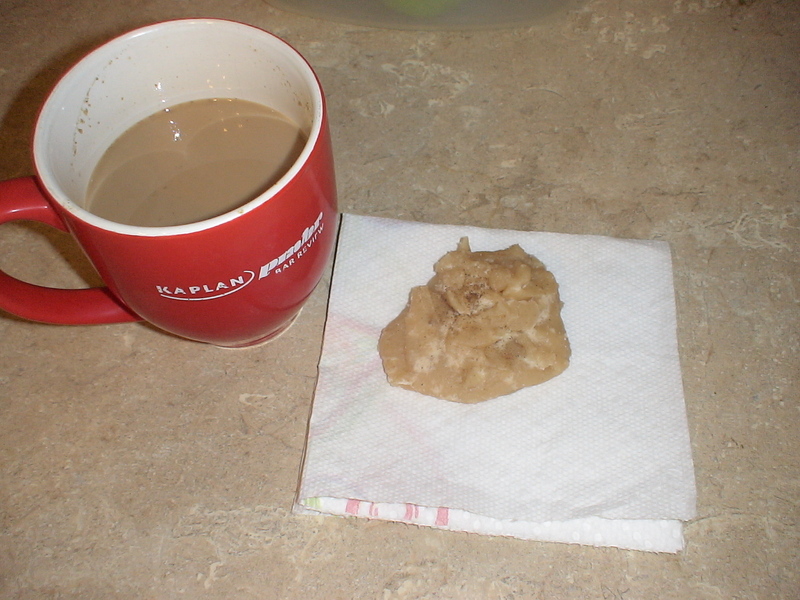 Kenyan chai with peda. It goes quickly in our house.